The first game's anniversary was actually yesterday but I wanted to let a little more news build up before posting to avoid the flood of news we had last week. Next year will be the big tenth anniversary so I hope we can expect good things! Game centres will be offering four different 120cm x 60cm Sengoku Basara: Judge End bath towels as prizes during November 2014 for lucky fans in Japan. The sample pictures are small so it's difficult to tell how the towels will look at full size. 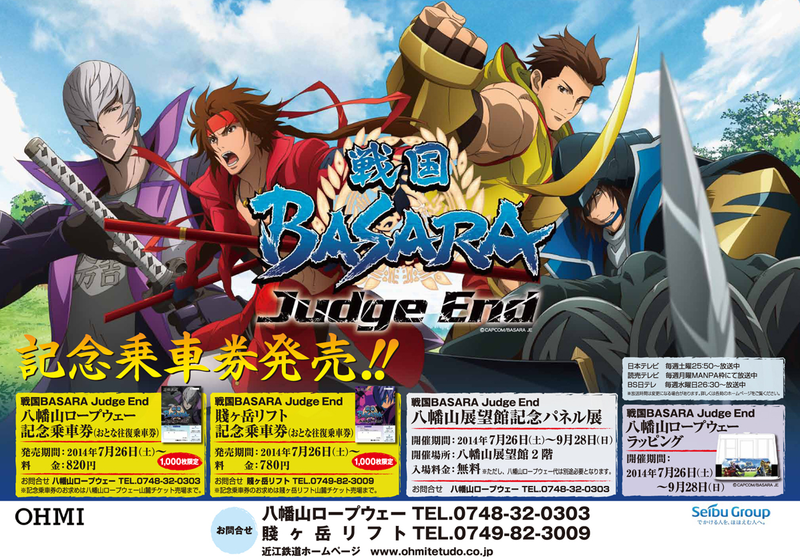 The Hachimanyama Ropeway and Shizugatake Lift attractions - both situated in Shiga Prefecture - will be hosting a Sengoku Basara: Judge End tie-in from Saturday 26th July until 28th September 2014. Visitors to the Ropeway can look forward to seeing cable cars decorated with Sengoku Basara: Judge End illustrations and a take a look at a free exhibition of Sengoku Basara display panels (standees). Another attraction for Sengoku Basara fans will be the special Ishida Mitsunari tickets on offer for the first 1,000 visitors. The Hachimanyama Ropeway tickets (leftmost picture) cost ¥820 and cover a single round trip on the cable car, while the Shizugatake chair lift tickets (rightmost picture) will be a little cheaper at ¥780. The latest tasty-sounding Sengoku Basara 4 tie-in is yasai-kayu, or vegetable rice porridge, featuring the series' vegetable enthusiast Kojuurou on the packaging. The description recommends enjoying the cold porridge during the blazing summer season. It will be available for purchase in Animate stores and a variety of other outlets from late August 2014. The city of Shiroishi in Miyagi Prefecture has long embraced its ties to the Date clan and in particular the real-life Katakura Kojuurou, who is something of a local hero. One of the cute side effects of this is that the local tourist board readily participates in Capcom's Sengoku Basara collaborations. There's a little shuttle bus called Castle-kun which takes tourists to and from Shiroishi Castle, and for several years a few of the vehicles have been proudly decorated with illustrations of Sengoku Basara's version of Kojuurou. It's difficult to walk through the town without seeing constant reminders of Sengoku Basara! It was announced today that another bus is going to be joining the fleet from 4th August 2014, this time decorated with the Sengoku Basara 4 versions of both Kojuurou and Yukimura (who also has strong historical ties to the Katakura family). The new bus will be on the Obara line and there will be a special event held one day before it goes into service, where fans can have pictures taken with the bus and apply to go on an inaugural tour. It's not all happy news, though: one of the earlier buses adorned with illustrations of the Production I.G. version of Kojuurou is being taken out of service at the same time due to its age. Fans are being given advance notice so they can say farewell to the old bus before it disappears for good. ...did I just write three paragraphs about buses? 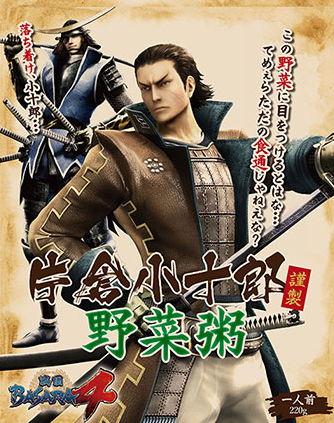 There was a great deal of excitement on the Japanese side of Twitter today when television coverage of the 'hugely popular Sengoku-era warrior' Sanada Yukimura was accompanied by his Sengoku Basara 4 character illustration. The coverage of popular tourist spots in the Shinshuu (Nagano) area created such a buzz that Yukimura began to trend for a while. 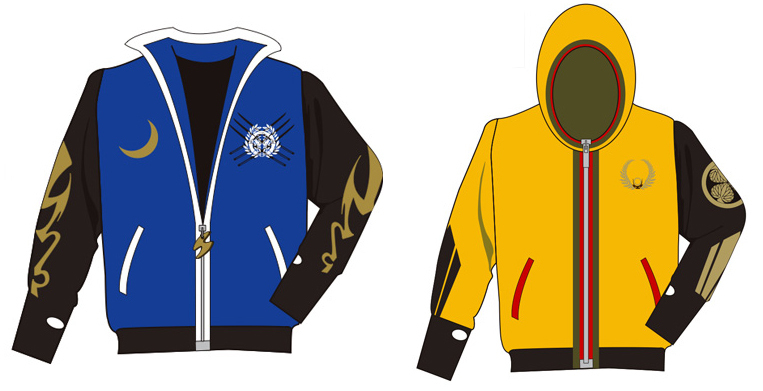 To go with the Motonari and Motochika jerseys unveiled last month, the Akita Shoten store is offering the older Ieyasu and Masamune jerseys once again for a very limited time. They're not cheap at ¥9,500 each and fans outside Japan will need to use a proxy service if they want to buy them, but this is an opportunity to get hold of some extremely rare merchandise so I'd recommend placing an order swiftly if you've been hoping to own one of these one day. At the time I'm posting this the Masamune jersey is about to sell out. 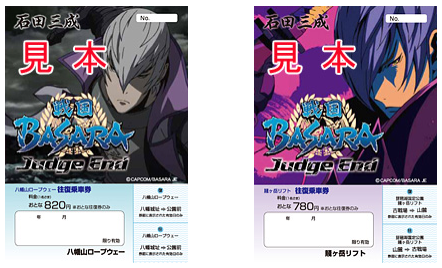 FUNimation have posted a new blog entry reporting that the first three episodes of Sengoku Basara -End of Judgement- (Sengoku Basara: Judge End) will be available on their streaming website from Saturday at 2:20pm ET, with the next two episodes to follow next Saturday. This will bring them completely up to date with Japan's broadcast schedule so the US simulcast is finally on the way! That's all for the regular news coverage, but two other interesting things took place yesterday on the game's ninth anniversary which I should give a proper mention on this blog. Organization ASG is a great blog which I've been reading for some time; it covers the western anime and manga industries (and it's already paid more attention to the series than certain mainstream news sites). Even if you completely disagree with every word I said in the interview it's still worth checking out! Lastly, I want to show off a cute picture my friend (and extremely patient Sengoku Basara co-op buddy) drew to celebrate the character poll we all did here a few months ago. He tried to add lots of cute little details. It made me happy, so I'm going to use a tiny version of the picture to brighten up this post! I sent FUNimation an email begging them to market it as a reboot instead but I'm not sure whether they'll listen (especially as I'm technically not supposed to be one of their customers >_>). Oh well, if fans keep talking about how it's not a third season eventually anyone Googling it will be forced to accept our version of the truth! The more faithful adaptation later on was definitely a marked improvement! Just had to post this - the worst of Devil Kings got to be Yukimura's (Scorpio) personality make-over. "Prepare to feel my spear twisting in your spleen!" "Should I bring a date to the battlefield next time too?" Okay now I want to forget about this game again. After that weird game I didn't become a SB fan until much much later when there was proper translations coming out in English. I'm going to have nightmares after watching that clip! This Motochika comparison is my partner's particular favourite: http://www.behindthevoiceactors.com/voice-compare/Sengoku-Basara/Chosokabe-Motochika-Arslan/. Oh well, it was probably a great game to bring out at parties to make people laugh. Sorry about the nightmares :D Your partner is clearly a strong soul because I and many others can only handle about 5 seconds of ”Arslan’s” voice.